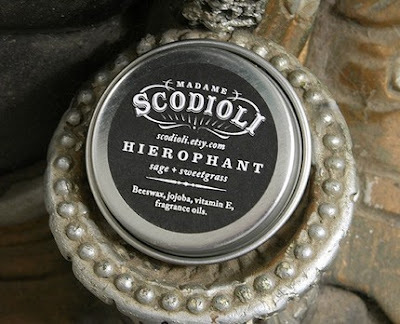 Today’s etsy shop giveaway is from seller Madame Scodioli. I am a seeker of all things bath and body. So of course I love her little tins of fragrance and handmade vegan soaps. The one posted above is Hierophant: Hierophant’s purpose is to bring the spiritual down to Earth. This crisp, clean blend of sweetgrass and aromatic sage with supporting notes of bergamot, geranium and amber will do just that. A mystifying scent. Contains beeswax, jojoba, vitamin E oil and fragrance. After the gates close and all is quiet on the midway, Madame S. retires to her wagon and spends her evenings sewing, crafting and making soap for the rest of the performers.Her soap and perfume are crafted from highest quality ingredients, always tested personally by her and the rest of the troupe. And our giveaway looks heavenly. I’m not a coffee drinker myself, but every time I drive up to Starbucks to get my cocoa I admit I take a big whiff. LOVE the smell. 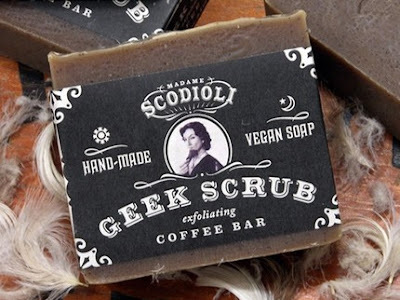 So this is perfect for those of us trying to embrace our inner geek! Contest ends on March 26th, 2010 and is open internationally. Please email us of you cannot comment below. Great giveaway count me in. This sounds amazing, I’d love to win! I’d love to win, thanks. goodness, what a great product name. +3: am a new follower of the blog; thanks! TOTAL = 15 entries!! Yeah!! Hmmm…I just submitted my comment for 15 entries, and got a message that said my comment was published…but it’s not here. So here we go again! Great giveaway! Thanks for the offer! +2 I’ve favorited your etsy shop (seewee)! enter me please 🙂 – great giveaway! +1 karenb(at)ourbrisbane(dot)com – this looks fabulous, I’d love to try it!! total I got 15 entries .